Wargaming is a very popular pastime amongst people of all ages. It is something that has been around for more than a hundred years when the elite would gather for a night of entertainment, initially with Napoleonic figures. These are still a huge attraction, but over the years, it has expanded to where now, just about anything goes, including fantasy figures. Most of the figures used today are not the hand crafted or hand molded lead figures of days of old, but are more likely pewter if they are metal or for most, plastic. The type of plastic used for these figures is generally closer to vinyl than it is polystyrene, as much to keep parts from being broken away as anything. Today's figures can be painted and have separate bits that can be held in place with contact cement or other glues that work with flexible plastics. This kit from Zvezda is part of the 'Age of Battles' game system. These assign certain points and movement values to the different figures, and all that is included in an additional sheet within the box. 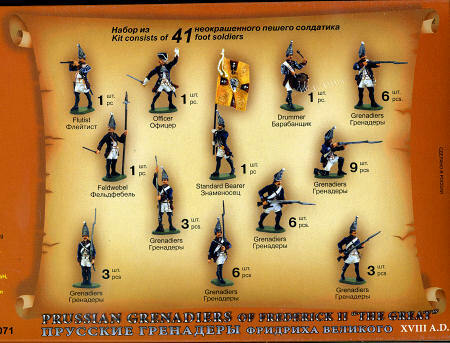 Zvezda is the largest makers of wargaming figures in Russia and provide figures for a variety of different eras so that wargamers can duplicate a variety of scenarios. This particular set contains 41 figures in various poses. The vast majority are Grenadiers but it includes a single standard bearer, flutist, officer, drummer and Feldwebel. 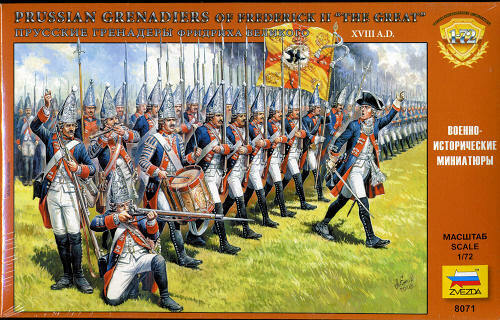 Of the Grenadiers, there are a minimum of three with some having six or nine each. The back of the box provides a full painting guide and while no specific paints are provided, the builder can pretty well choose what he or she thinks is appropriate. The front of the box also provides some inspiration if one is willing to do that sort of detail painting. I know you are all going to want to rush out and purchase a set. Things like this are great for kids and their parents as well. Soft plastic figure sets have always sold well and since this one is part of a gaming system, I know it will do better than usual. My thanks towww.dragonmodelsusa.com for providing the review sample. If you don't find them at your local hobby shop, ask for them.